Sunday, June 19, 2016 — 4:00 p.m.
Free admission; donations to the SPC Adult Choir Scholarship Fund are welcome. Praeclara presents a delightful afternoon of music just in time for Father’s Day. 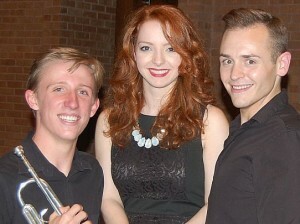 Second Presbyterian Church’s Eric Meincke (trumpet) performs alongside Praeclara vocalists Kelly Singer (soprano) and Jonathan Pillow (bass-baritone) in a program that features each musician performing both collaboratively and as a soloist. Their diverse repertoire will entertain the entire family! This performance celebrates two of our graduating musicians. This spring, Kelly Singer completed her undergraduate studies at the University of Arkansas at Little Rock, while Eric Meincke graduated from Little Rock Central High School (and will attend Florida State University this fall). Jonathan Pillow, a graduate of UCA, is pursuing his Master of Music Degree. These three young musicians enrich the musical life of Second Presbyterian Church and the community at large through their talent and dedication to their craft. Admission to the recital is free. Audience members are invited to donate to the Second Presbyterian Church Adult Choir Scholarship Fund, which offsets the cost of travel for choir tours and retreats for the young adult members of the choir. This scholarship fund makes it possible for our young musicians to gain experience performing across Europe and North America, in countries that include Scotland (2010); Western Canada (2012); Germany, Austria, and Hungary (2014); and the British Isles (summer 2016)! These opportunities help the SPC Adult Choir to recruit, maintain, and grow a vibrant and thriving membership of all ages. Photo credit: Pictured left to right — Eric Meincke, Kelly Singer, and Jonathan Pillow. Photography by Clementine Whitman.